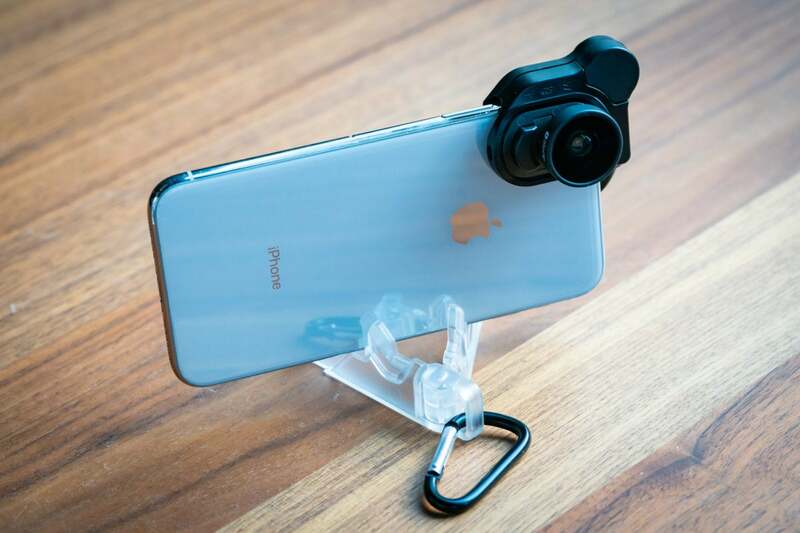 Olloclip is known for its iPhone camera lenses that easily snap on to the phone, and with its new Connect X system, the company introduces a new iPhone X lens design that makes attachment quick and accurate. Everything joins together, making it easy to take with you. 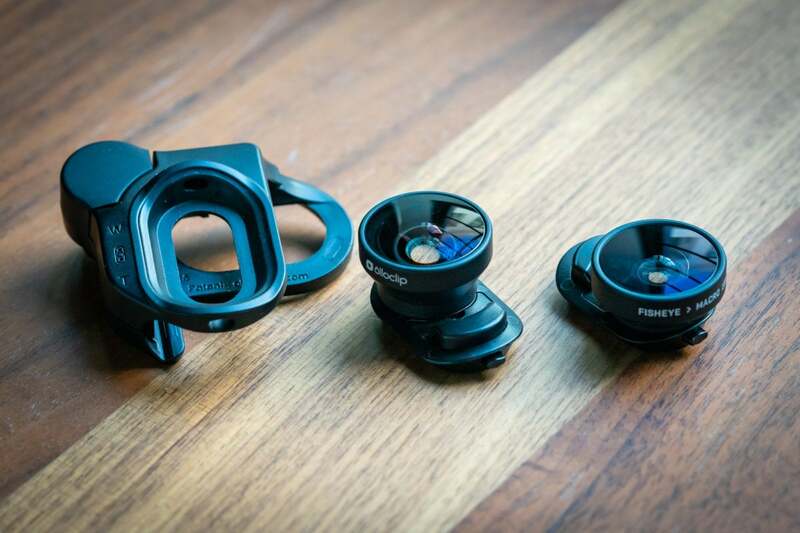 The Connect X system lenses in Olloclip's Mobile Photography Box Set looks unlike other lens attachments for phones. The Box Set includes a mount that works for both the front and rear cameras, a super-wide lens, a combo fisheye + macro lens, and an attaching stand. 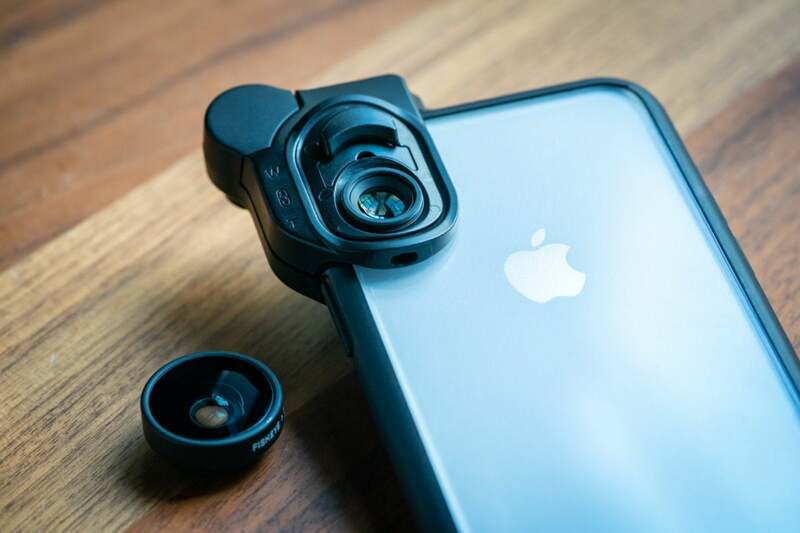 Olloclip's camera mount was also redesigned for the iPhone X to accomodate the rear-facing cameras on the iPhone X, which are vertical instead of horizontal. Olloclip also says there was an issue where the previous mount tended to remove or scratch lens screen protectors—that shouldn’t be a problem with the new design. Instead of sliding on, a button is now pressed on the mount that expands the phone slot. Press the button and the gap closes, resulting in a snug fit. Because of the rear lens protrusion of the iPhone X, the mount is able to lock over it, preventing any sliding. I had no problem getting the mount on or off and it's a much faster way of attaching a lens over any other iPhone lens system. If you demand a case, Olloclip does have you covered with a new clear back slim case that's fairly slim. 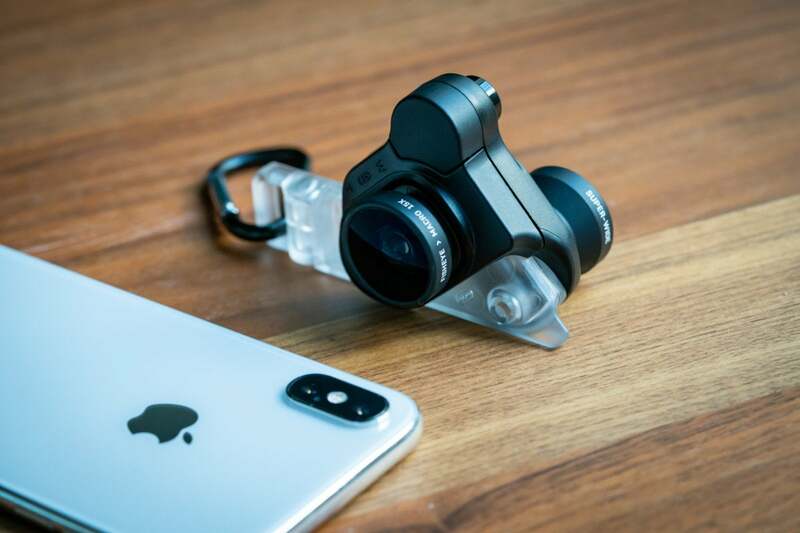 Olloclip offers a wide selection of six lenses that can be purchased with Connect X mounts or alone as add-ons: Super-Wide, Ultra-Wide, Fisheye + Macro combo, Telephoto, Macro 14x + 7x combo, and a Macro 21x. It’s hard to imagine lenses any smaller or lighter than these. Each lens has a small plastic mounting piece that can be flipped around to work on either the built-in standard and telephoto lenses of the iPhone X. It’s easy to do, but I’m not entirely sure how useful a wide lens is on the rear telephoto camera when you can get a much sharper image using the rear standard camera instead. The Mobile Photography Box Set is the only kit with multiple lenses; it includes the Super-Wide and the Fisheye + Macro combo. The previous lenses for older iPhones are not compatible with this new model for the iPhone X. Olloclip's hope is that the new lenses will work with future iPhone models though. Considering its size, the Super-Wide lens is surprisingly decent. After testing several other wide angle lenses, the Olloclip comfortably sits in the middle of the pack. Optically, it’s not as good as the premium lenses from Moment or Sandmarc we reviewed, but it’s certainly better than the budget wide lenses popular on Amazon. Olloclip says they shy away from using 35mm focal equivalents, and says that the Superwide offers a 125-degree field of view. This is just a little bit wider than Moment’s wide angle lens. The Olloclip Super-Wide overall has a bit more distortion than the comparable, larger premium lenses, likely because of its size and the limited glass elements inside. That may be an issue if you tend to shoot objects with a lot of straight lines (like architecture), but you should be fine if your primary subjects are people or nature. Fortunately, I wasn’t able to discern any chromatic aberrations but that could equally be the iPhone doing some correction. I'm torn on Olloclip's Fisheye because fisheyes can come in two forms, either full frame or heavily vignetted where the image is circular in the middle and the edges are black. The Olloclip Fisheye is one of the latter, and as someone who shoots photos and video professionally, I’m less inclined towards that style. On the other hand, it creates a fun, very stylized look that’s reminiscent of toy film cameras like the Lomography Fisheye. The decision to include this lens instead of the Ultrawide (which behaves more like a full frame fisheye) indicates that the target audience isn’t the professional but more the casual photographer looking to up their game. As for the image quality, no surprise, but it’s not very good. It’s not very sharp, and towards the edges it gets even worse. The example above shows how the distortion maps. Definitely think of this as a toy lens that can produce images fine for the web but won’t hold up for prints. The Fisheye can also be unscrewed to reveal a 15x macro lens. Macro lenses on the iPhone offer a very limited distance in focus that restricts the framing options you can really do. With this lens, the combination of the focusing distance and the magnification only lets you focus on very tiny objects. For example, I wasn't able to focus on an entire apple blossom. Comparing this to other macro lenses, this was about twice as close. It's unlikely that you'll ever use this lens. 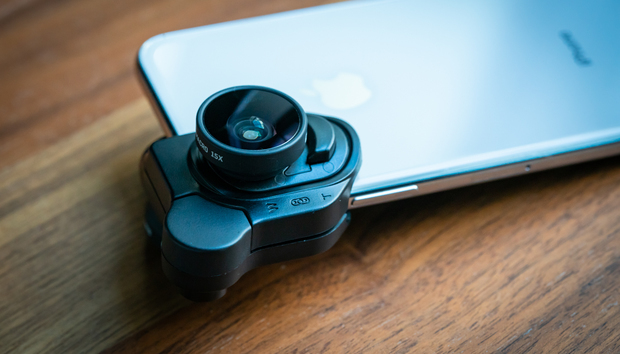 The final part of the Olloclip kit is a stand that the mount can clip onto when not in use. It comes with a carabiner, making it easy to attach to a belt loop or backpack while walking around. It’s a useful addition and goes to show both the mindset and target of the system. I'm a fan of Olloclip's Connect X lens system. The size of the lenses, the ease of attachment, and the bonus usabilitly of the stand make the whole kit all the more likely you will carry it around. As the saying goes, the best camera you have is the one with you. So goes the same for lenses. 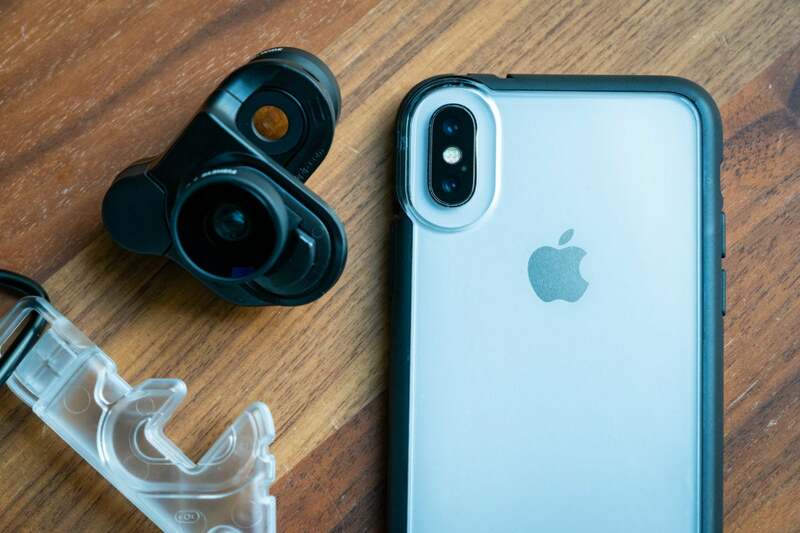 A set of the Olloclip lenses and an iPhone certainly isn't a true substitute for a digital camera with interchangeable lenses—or even the other premium iPhone X lenses available. But if you need to pack light or want to carry it around everyday, then the Olloclip system is a great bet.